If I’ve been asked this question once I’ve been asked it a thousand times, “ Mike – how big should I make the opening for my new shower?” OK – I’ll give you my standard answer. It depends. Boy doesn’t that sound like a cop-out! In all seriousness designing a shower opening is a bit like being a politician -you’re trading off competing interests. 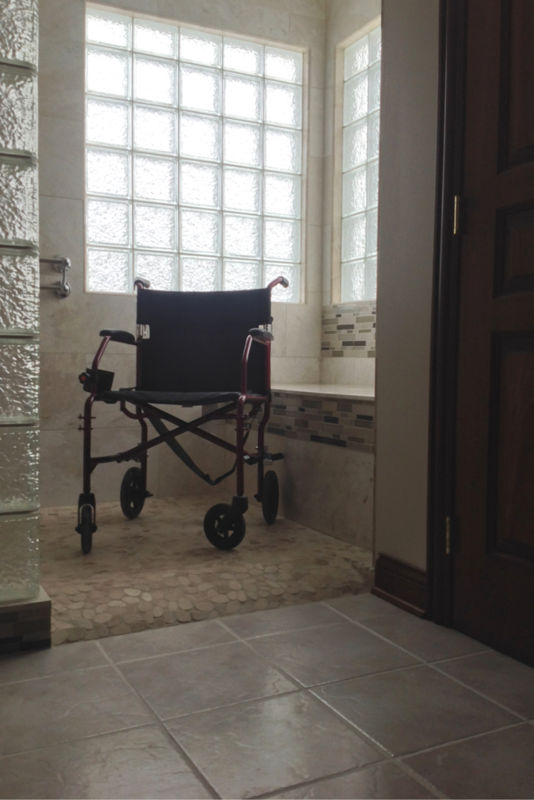 On one hand you want to have the biggest opening so it’s simple to get into and out of the shower whether you’re walking in, shuffling in or rolling in with a wheelchair. On the other hand you want the opening as small as possible so you don’t get water pooling on the bathroom floor which could lead to leakage in the floor below. Given these competing benefits of a smaller vs. larger shower opening where does that leave you? 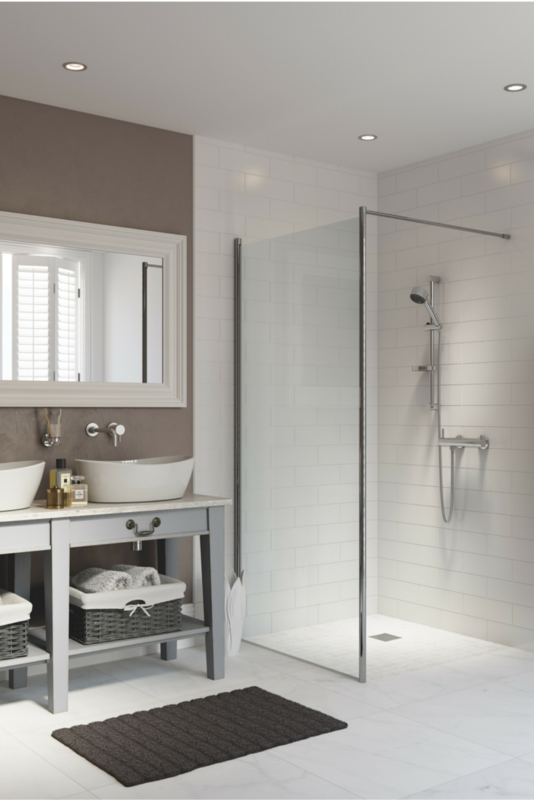 How can you find just the right sized shower opening for you and your family? Explore the answers to the following 5 questions and you’ll be assured to get the size and design of your shower opening correct. Question #1 – Who is going to use this shower now and possibly in the future? Start out by identifying who will use the shower today…and possibly in the future. Is your son whose claim to fame is being a “lean and mean” 350 lb. defensive tackle of the football team going to be the main user or is your daughter who is a pencil-thin gymnast using this space? Obviously if you’re designing the shower opening for your son it will need to be significantly wider (you may want go in the 28″ to 32″ range). What can/should you do if they are both going to share the shower? I would recommend to split the difference in the opening size – which may mean your son will step into the shower sideways vs. your daughter going in straight on. While considering the here and now usage of this shower is critical – you will not want to lose sight of who may be using it down the road. Is it possible your Mom or Dad may come to live with you if their health starts to fail? If so – the new shower opening may need some design tweaks (possibly a ramped entry, a lower curb or one level base design) which will prevent you from ripping out the brand new shower you’re putting in right now (see question 3 to get specific ideas). If the shower is for someone in a wheelchair I would recommend a 36″ opening – if it’s for someone in a walker 28″ to 30″ would be OK. Question #2 – What method are you going to use to get into the shower? Do you need to walk straight in or are you OK stepping in sideways? This may seem like a funny question but it is important and practical. If you’re walking straight into the shower you’ll need significantly more space than if you’re stepping in sideways. When determining the opening for a straight in entry – which is preferred by most- I recommend measuring across the shoulders of the people using this shower. You’ll want to use the largest shoulder to shoulder measurement of all the people using the space to drive the size of the opening. 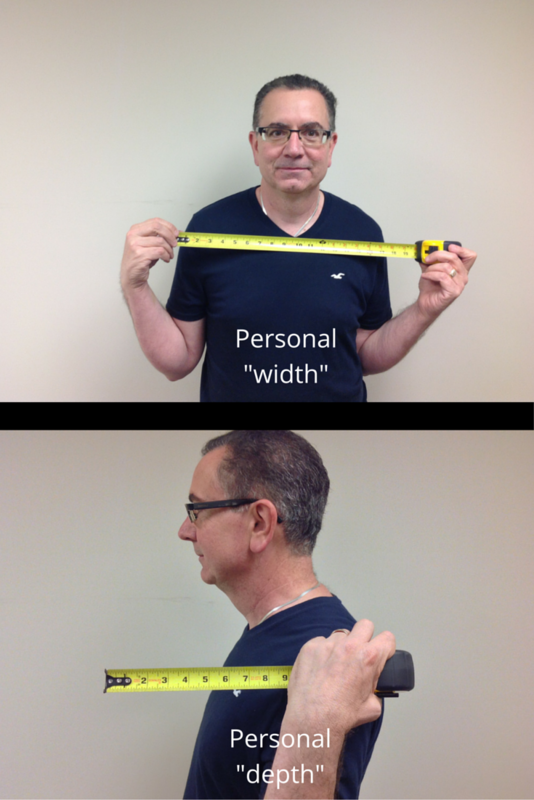 On the other hand if you’re OK with a sideways entry you can measure the “depth” of the person (you’ll see from the pictures below my depth is smaller measurement than my “width” – yes – I may be holding in my gut a bit on this picture!). If you have a small shower the sideways entry may be required but in general the most common straight in entry for people walking in is 24” wide. If you’re designing the opening for a wheelchair or walker for your home know you do not need to follow ADA (Americans with Disabilities Act) guidelines for public spaces which require a 36” wide opening. With that being said you do want to make the opening comfortable to get into. In this case I would recommend you get a measurement of your family member in their wheelchair and allow side to side clearance room for their hands. 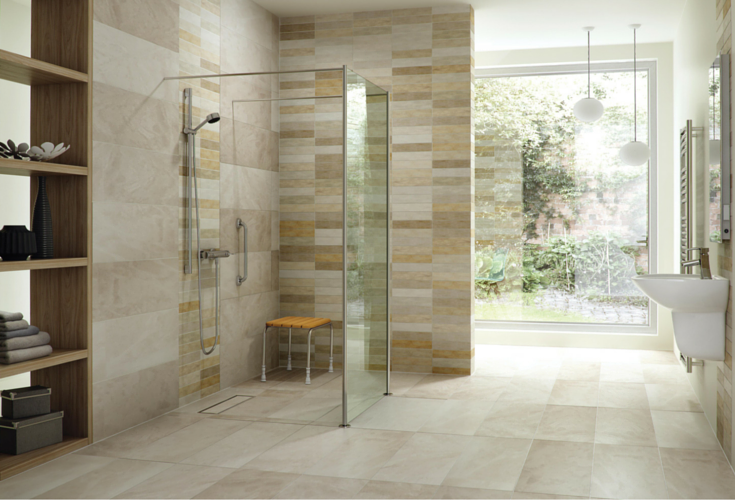 Question #3 – Are you stepping over, ramping up or rolling in (designing for either a curb or curbless shower)? Not all people using a shower are created equal – I’m sure you’re saying tell me something I don’t know. Your family (if it’s like mine) – is definitely made up of some characters in both their personalities and physical capabilities. A “simple” 4” high shower curb which is a breeze to step over for your football playing son and gymnast daughter, could be a huge mountain to climb for your elderly Mom. So for the kids the 4” high step over curb (which does a great job keeping the water in) is no problem, could be the wrong shower entry design choice for Mom if she is mobility challenged. Option 1 – The 4” tall step over curb – generally the preferred method for small showers because it keeps the water in well in small spaces. This is an unacceptable and dangerous choice for anyone with limited mobility. Option 2 – Low profile curb – This lower curb (usually about 1 ½” tall) provides for a sleeker looking design and is safer than option 1. It has the benefit with a solid surface shower base of having the flexibility to add a curb extension should a family member need a ramped entry down the road. If you want to keep costs lower you can also choose a low profile acrylic shower pan like the second picture shown below in this section. Option 3 – Barrier free ramped entry – This ramped entry will have a slope up to get in and a slope down towards the shower drain. It creates a “curb free” design where you get in. This design works best with a base which is a bit wider. Option 4 – One level wet room – This is a cool and underutilized approach in the United States. This design provides a shower floor which is at one level with the bathroom (note – the drain is still a bit lower than the floor level). It is super popular in European and Asian countries where space is limited. It can provide a sleek contemporary design – but better yet – it is safe and completely workable for small showers (my wife’s Grandfather had this type of wet room shower in a 4’ x 5’ bathroom in Italy – now that’s tiny!). 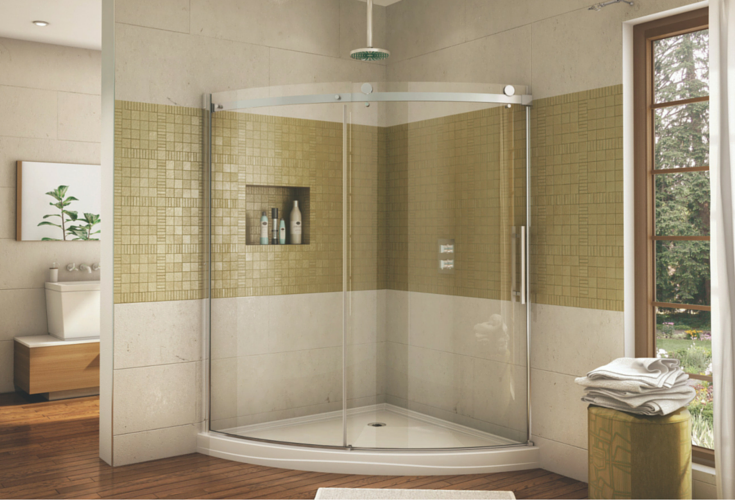 Question #4 – Will you use a doorless walk in shower or a framed or frameless glass shower door? When you design a walk in shower the finished opening is not made smaller by any hinges or framework (basically the opening is the opening!). 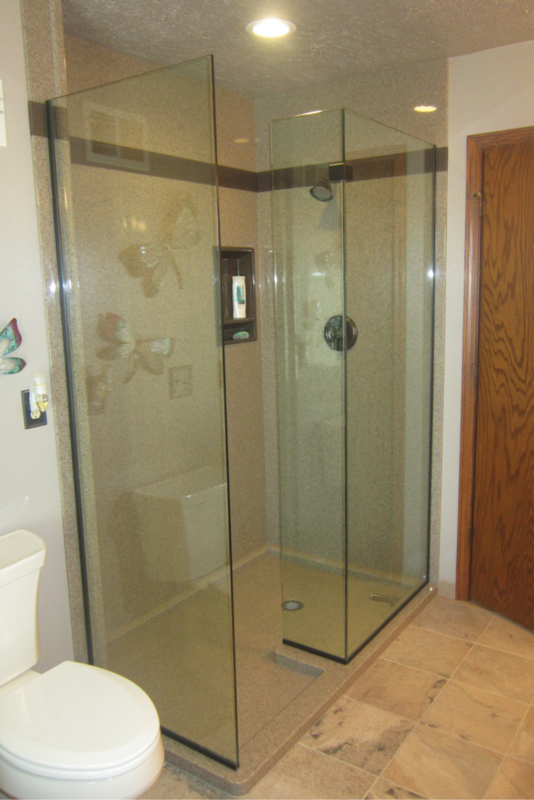 Walk in showers are growing rapidly today as people want to eliminate the cost of a door and hassle of cleaning them. With this being said walk in showers are not practical for every situation. This is usually true where there is only room for a small shower. If you are looking at a shower door you’ll want to think beyond the “rough opening” (the opening before you install the door) and focus on the “finished opening” (or the space which will be left minus any framework around the door). A frameless door will give you a larger finished opening than a door with a framed system around it. The frameless system (see the image below) looks more luxurious, but comes with a higher price tag. The actual size of the openings in these systems can range from about 20″ to 28″ wide. Question #5 – Will you have more than one opening? This one sounds like a trick question. How can you have more than one opening in a shower? The answer is – when the glass (or framed enclosure) has either a curved or L shaped design. Many walk in showers are not straight walls but have shape to them so the water will be directed back into the “wet area” (shower head area) of the shower. What this means is you actually have two openings. 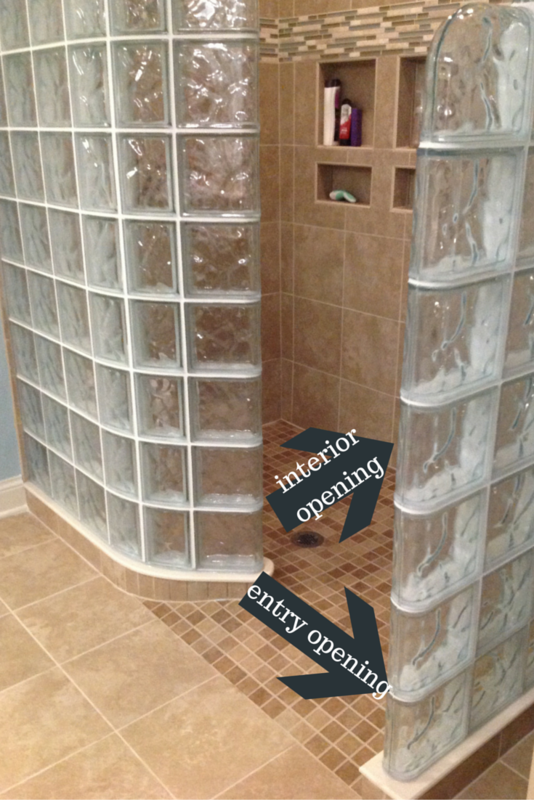 One is the “entry opening” where you step in and the other is the “interior opening” as you move towards what I like to call “the business side” of the shower (check out the entry and interior openings of this shower system below). I usually like to have the entry opening be 24″ and the “interior opening” to be 28″ plus. While the entry opening is critical so is the “interior opening.” If you make the interior opening too small you’ll get a shower which feels cramped. I usually recommend the “interior opening” be at least 4” wider than the “entry opening” to make the shower feel like one continuous space. If your shower is large it can work out just fine to create a separate entry area vs. the main showering area, but for more compact spaces I recommend one continuous space. OK – how have I done? Do you feel you know the right questions to ask how to figure out the size and design of your shower opening (or openings)? Please comment below or call us so we can help you with your bathroom remodeling or shower design questions. If you’re looking for more information or an estimate on remodeling a shower or nationwide material supply for the shower wall panels, shower bases or wet room systems call The Bath Doctor in Cleveland (216-531-6085), Columbus (614-252-7294) or for nationwide supply Innovate Building Solutions (877-668-5888). I have a stand shower that is 64*28 inches (L shape). I want to put a glass panel on the 64 inch side with enough entry room and at the same time prevent water spashing . What is the optimum size for the glass panel .Will a 36 inches glass panel prevent water spashing? The International Residential Code specifies that the minimum finished width for a shower access opening is 22 inches. The height is not specified but one would expect that it would need to be tall enough to enter without hitting your head the bar at the top of the door (if one happens to be present). The minimum height for the non-absorptive portions of shower walls is 6 feet. That would imply that top of the door would need to be a minimum of 6 feet off of the floor of the shower. If 6 feet is not enough (for the taller among us) then you would want a shower door that does not have a top bar at the top of the door that is 6 feet off of the shower floor. A door that has no top bar would be called for and the height of the opening would need to be higher than the top of the bar-less door that is 6 feet off of the shower floor. My husband and I want to remodel our master bathroom, and we’d like to get a new shower enclosure put in. You make a good point that you should think about the finished opening rather than just the rough opening. We’ll have to do that once we find someone who can make a shower enclosure for us. How did you manage to write an entire column about shower entry sizes without ever answering the question? You give one reference to a 24-inch opening if you are walking in straight vs. sideways. Other than that your answers are all vague with no actual dimensions. I have a debate ongoing on which side the fixed panel should be, leaving the other half door to slide. I have a 3.5’x5′ shower pan with shower head on the left wall (which is 3.5′ ft wide). Which side should should the 1/2 panel, which is fixed, should be installed? What are the pros and cons and what do the designers think? Need a quick reply as my contractor is waiting. Thanks very much. Excellent question! Hinged shower doors (if that’s what you have) offer little opportunity for adjustment (since they are hinged to the side of the opening. On the other hand “pivoting doors” where there is a hanging channel on the side of the door will offer you from 2 – 2 1/2″ of adjustment. You may be best going with a pivoting door for your project. Please help! My shower door opening is 30 1/2 inches but all I can find are 30 and 31 inch doors. Am I missing something here? Am I stuck with having to buyi one that is adjustable? Thank you for any help you can give.